Two oak trees were planted to commemorate the marriage of Prince and Princess of Wales in 1863. 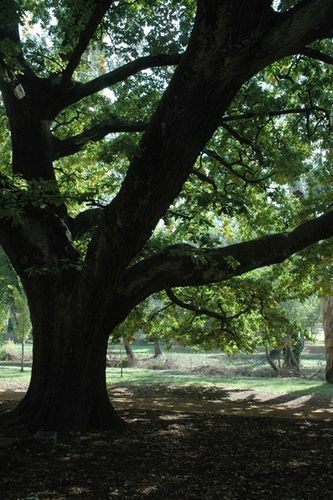 The "Albert and Alexandra oaks " will be planted this morning with due ceremony, in the centre of the Botanic Reserve. This ceremony, though not a very exciting one, is one of the most interesting in the day's proceedings, The traditions which cluster round the British oak,— "the brave old oak,"— are such as to enkindle the enthusiasm of every Anglo-Australian. Excerpt from The Marriage Celebration, Demonstration at Castlemaine, Mount Alexander Mail (Vic. ), 19 May 1863. Note: The date on the plaque is given as the 26th May 1863. Prince & Princess Of Wales.